The wait is over! 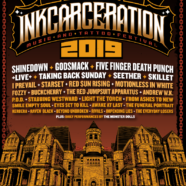 The INKCARCERATION Music and Tattoo Festival has announced the massive line-up scheduled to perform at its second annual event, set to feature colossal rock headliners Shinedown, Godsmack and Five Finger Death Punch! Quickly becoming one of the nation’s premier rock festivals, INKCARCERATION – taking place this year on July 12, 13 and 14 at the historic Ohio State Reformatory, a.k.a. Shawshank Prison, in Mansfield, OH – will feature over 30 bands on two outdoor stages, 70 tattoo artists, reformatory tours, gourmet food trucks, the best drinks and for the first time, the haunted house attraction, Escape from Blood Prison! This year’s electrifying line-up also includes +Live+, Taking Back Sunday, Seether, Skillet, I Prevail, Starset, Red Sun Rising, Motionless in White, Fozzy, Buckcherry, The Red Jumpsuit Apparatus, Andrew W.K., P.O.D., Stabbing Westward, Light the Torch, From Ashes to New, Smile Empty Soul, Eyes Set To Kill, Awake at Last, The Funeral Portait, Kerbera, Raven Black, Beyond Unbroken, Rivals, Impending Lies and The Everyday Losers, plus special performances by The Monster Dolls. Once again, INKCARCERATION Music and Tattoo Festival will take place at one of the most unique festival settings in the country – the Ohio State Reformatory. Considered one of the most haunted buildings in the country and the setting of the 1994 cinematic classic/IMDB’s highest rated movie of all time, The Shawshank Redemption (celebrating its 25th anniversary his year), the Reformatory is centrally located about an hour away from Cleveland, Columbus, and Canton/Akron, Ohio and within a three-hour driving distance of Toledo, Dayton, Cincinnati, Youngstown, Pittsburgh, northern West Virginia, Michigan and southern Ontario. This is the perfect destination festival! Additionally, INKCARCERATION features tent and RV camping for a true outdoor festival experience! See below for more details. It’s Halloween in July at INKCARCERATION 2019! “It’s an honor to be able to open the doors of Blood Prison a couple months early and give the guests of INKCARCERATION a few scares in July! The warden, his family and the Blood Prison inmates are all excited to meet the fans at INKCARCERATION,” says Vic Amesquita, manager of Blood Prison. – General Weekend Tent Camping includes 1,000 sq. ft. space for your car and up to 3 tents. – 2 cars and 2 tents can also fit. 1000 sq ft is yours to work with. – General Weekend RV camping includes hookups for electric & water.